hotel Villa GinevraWe are waiting for you in Cavallino-Treporti Venice! The Hotel Villa Ginevra is situated in the tranquil and quiet area of Cavallino-Treporti, far from the main road and only 700 meters from the beach, it is a family run business, ideal for all sun and nature lovers, for those who enjoy the outdoors and long bike-rides around the Venetian lagoon countryside. The Hotel Villa Ginevra rooms have been recently renovated and all now have airconditioning, you can also use the Internet from anywhere in the Hotel with your own PC. 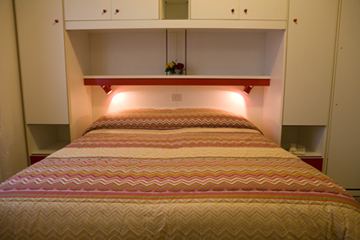 All rooms have showers, telephone, controlled air-con unit and satellite TV. 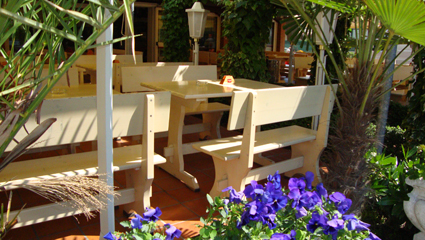 he hotel also has a large terraced area for the restaurant and pizzeria. Our guests will always have the pleasure of freshly prepared dishes, made from the highest quality products, typical of the local area. The Villa Ginevra not only offers delicious fish and meat dishes, but also pizzas prepared with soya flour, complete with the best topping ingredients in produce. The Enzo family looks forward to welcoming you to their Hotel where you will feel at home and well looked after! 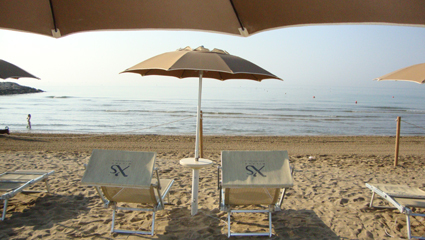 We wait for you at Cavallino- Treporti, Venice! In just under 10 minutes you can get to the ferry port and catch the boat to Venice and the islands of the lagoon, Murano, Burano and Torcello. For all guests who like the night life, you can find pubs, bars, live concerts in the piazzas, discos and shops at the nearby town of Jesolo, just 3 km from the Hotel. We have 16 double rooms, on request we can divide the beds.